Fort Magia is a medium-sized fort east of the Imperial City containing undead (quest-related). It contains three zones: Fort Magia, Fort Magia Memorials, and Fort Magia Garrison Blocks. 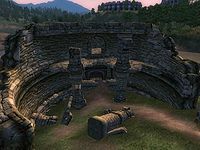 Fort Magia appears in ESO as Magia Ruins. 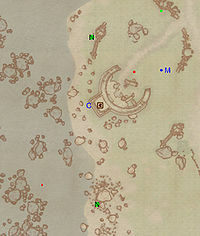 This location's map marker (M on map) is named Fort Magia (editor name FortMagiaMapMarker). The entrance door is WSW of the marker, 130 feet away. The northernmost ruined tower (just south of Wellspring Cave) contains a chest with gold and a barrel with minor loot. 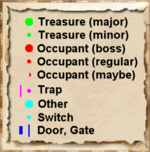 This first zone is, like the rest of the Fort, entirely linear and very easy to navigate. 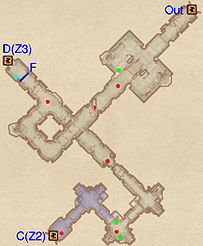 It will lead you all the way down to the flooded Fort Magia Memorials so water breathing abilities should be considered. Upon entering from door Out, make your way down each set of stairs, fight the numerous undead enemies blocking your path and pick of the minor loot from a few chests along the way. Door D functions as an easy escape route from the third zone, Fort Magia Garrison Blocks and is blocked by a Portcullis Gate (F) so proceed forward and dive down to door C and enter the next zone, Memorials. From door C, swim through the tunnel and deal with the residing slaugterfish on your way. Surface in a larger room and raid the underwater alcoves for minor loot chests then continue up the stairs for an encounter with a few undead enemies guarding two coffins. Proceed into the next pool of water and repeat the procedure. 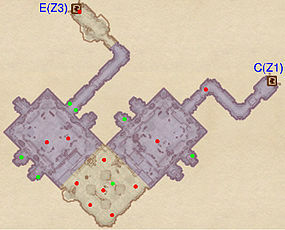 The northeastern exit contains two additional chests and access to the third and final zone, Fort Magia Garrison Blocks, through door E.
Upon entering Garrison Blocks from door E, jump into the water and pick open the underwater boss-level chest at B. Continue through knee-deep water in a northern direction and deal with the boss-leveled undead enemy at A. 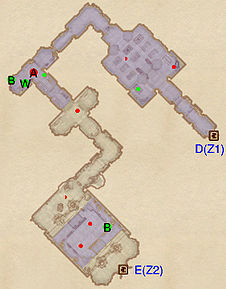 Pick up the Shadowbanish Wine from the chest at W and pry open the boss-level chest at B for your reward. Continue through the water and an old wooden door until you reach door D, which provides easy access back to the very first zone, Fort Magia.